It’s a photograph that could be found on the wall or mantlepiece of any poor Pakistani household. The couple stand rigid, staring at the camera, dressed in their best clothes. Photographs are an expensive luxury for the poor of Pakistan, so they have invested in their appearance for this one snapshot. They are young. The woman in pink, her hair carefully brushed and wearing a pink beaded jewellery set, holds on to the arm of the man in a light grey striped kurta. They stare at the camera, unsmiling. Smiling in photographs is considered undignified, and this photo is tellingly aspirational. It speaks of a life they would rather be living, a dignified life, one where they have time to take photographs in their best clothes with a lake of swans behind them. The superimposed background could be anywhere, Switzerland, or maybe Austria. What it isn’t is their grim reality, the daily grind of bonded labour at a Pakistani brick kiln. They will never see that swan lake, because they are too poor. They will never see it, because on November 4, 2014, the couple were murdered. What I’ve not told you up until now is the real crime of these two people. They were Christian, and they were in bonded labour, which they tried to question. Pakistan has a terrible track record when it comes to minority rights and incidents like these are not uncommon. At the start of the first Gulf War, an American nun who was the headteacher at my local school in Bahawalpur was gunned down. Years later in 2001, gunmen broke into the school’s church and opened fire. Thousands of miles away, I watched the news reports in complete shock. There was the aisle I had walked down as a bridesmaid. There were the church grounds I had played in. It was the country’s first massacre of the Christian community. The reason this particular case has made global headlines is because it was so inhumane, so barbaric, that it defies belief. In the early hours of November 4, after an announcement by the local religious leaders that the couple had desecrated a copy of the Quran, around 1,000 villagers in Kot Radha Kishan descended on the couple’s house and tore through the thatched roof to get to the terrified couple. According to the family of the couple, the order came from the owner of the brick kiln. They were dragged from their house. Shama Masih, whose name means ‘light’, was thrown into a frenzy of utter darkness, utter hopelessness. She was already a mother to four children, and awaiting the birth of another child. This didn’t matter to the crowd that set upon them. On unfounded accusations of blasphemy, the couple were set upon with such barbaric intensity, that a friend of mine Fe’ereeha Idris, who reported the story and has seen a lot in her career, broke down in tears along with her crew when they heard the details. They were beaten, held over an open kiln until they caught fire and then thrown into the kiln. All that’s left of them are some bones and ash. The police watched as it all happened. No one intervened. I should probably say the police ‘allegedly’ watched, but if I know the reputation of the Pakistani police force, it’s more likely that they did in fact do absolutely nothing about it. In Kot Radha Kishan, the streets are now quiet. The men of the village have fled, leaving the women and children behind. They had the courage to defy God’s own law by taking another life in the most cowardly way, but they don’t have the courage to face the aftermath of what they have done. No one came to the aid of Shama and Shahzad Masih. Their family continue to shed tears and try to comfort the four children left behind. If I know how these things play out in Pakistan, nothing will come of this. The Chief Minister of Punjab made a hollow gesture and visited the village where the incident took place. The people will not be caught, they will not be punished. A society that cannot protect its most vulnerable citizens is a society that should be ashamed of itself. Pakistan should be ashamed, and as a Pakistani, I am ashamed. People took to the streets, they protested, I wrote a blog post, and then? We’ll all forget about this story and carry on, until it happens again. I didn’t want to write this blog post. My stomach turned as I read the details of the incident. But I can’t get their image out of my head. I see them again and again standing in front of that beautiful swan lake, hoping for a better life. That’s why I decided to write this story. 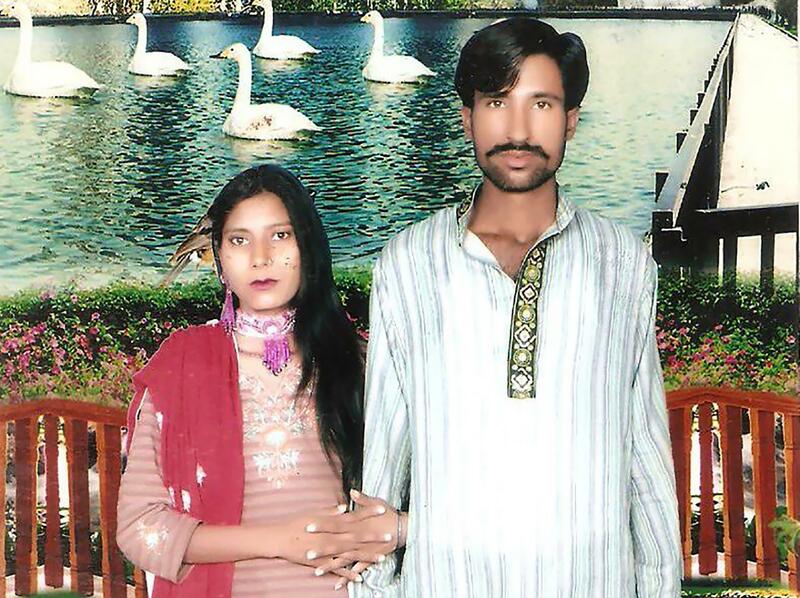 I want you to remember their names, Shama and Shahzad Masih. They deserved so much better than what life dealt them. I know it probably won’t make a difference, but I hope mine will be one more voice of outrage. Maybe, for once in their shambolic history, the government of Pakistan will do the right thing. The report, in Urdu, by Fe’ereeha Idris is given below. Shame is a small word here. I have always been hopeful. For my people. My country. But these incidents shatter every remnant of hope and all that is left is a word bigger than shame. A word bigger than disgust. A word I can’t find. I for one will always remember Shama and Shahzad. I hope God is taking good care of them up there. This is horrific – thank you for writing about it. I read this article of yours times and times again, trying to figure out how one can, in the year 2014, raise a mob against his indented labourers. That’s the stuff of chronicles I read, dispatches about the heretics which plagued my region in the XIV century. I struggle to believe that such a barbarity can still happen. I hope the responsibles get caught, or that the beast that sent the mob on this family feels the same fear they must’ve felt. I too cried for hours thinking they were humans with the same flesh and blood as any one else. Brings back images of the two brothers (Muslims this time) 4 years ago in sialkot who were beaten to death by a mob. Its not just minority, human life in general has no value in Pakistan. The 2 kids who were strangled to death by their own mother because of hunger. The time when mothers and fathers were selling their children to make ends meet. That van full of children that caught fire killing all of them. The woman stoned to death for marrying out of her own choice …. the 1000s killed in bomb blasts including women and children. All including minorities and majorities. Someone I knew was killed in a bomb blasts in an army mosque on friday. He was an imperial graduate … ready to be married a week later. The number of incidents are uncountable. Their is no minority majority … its humans that have no value. We should be ashamed for all of them.